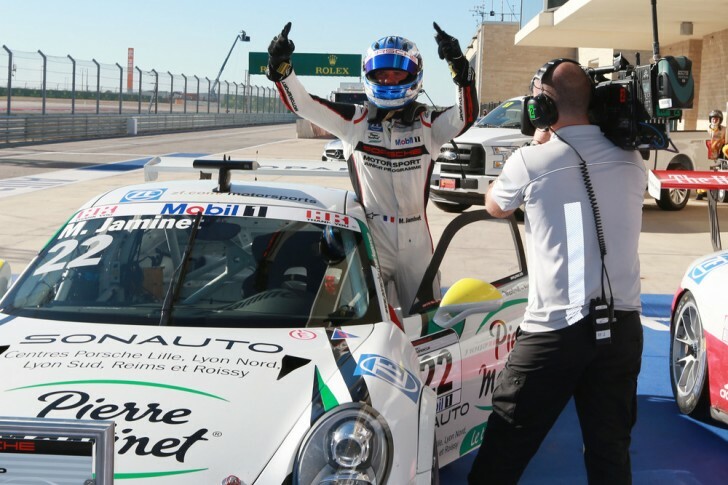 Porsche junior Mathieu Jaminet (F/Martinet by Almeras) won the ninth championship round of the Porsche Mobil 1 Supercup on Saturday. With this result, the title will only be decided at the very last race of the season in Austin/Texas on Sunday. In the nail-biting race, the hot championship aspirant Matteo Cairoli (I/Fach Auto Tech) dominated at the front of the field for a long time but did not reach the finish. This left the path clear for Jaminet, who won in his 460 hp Porsche 911 GT3 Cup ahead of his junior colleague Sven Müller (D/Lechner MSG Racing Team) and Robert Lukas (PL/Förch Racing by Lukas Motorsport). Heading to the final race on Sunday, Sven Müller holds a 20-point lead over Cairoli, who must win in order to maintain his theoretical chance to take home the championship title. Jaminet took off into the 14-lap race from pole position. Cairoli made a better start, pulled to the left and passed him under braking for the first corner. Müller, who had planted his Porsche on sixth in qualifying, made up three positions and slotted in behind Cairoli and Jaminet. The spearheading trio drove nose to tail over the first laps. Again and again, Jaminet and Müller attempted to overtake but no real opportunity arose. Instead, the camera crew focussed on the gripping but fair three-way fight at the front. While Jaminet was busy fending off repeated attacks from Müller, Cairoli pulled clear of his pursuers and after seven laps had built up a gap of 2.5 seconds. Then the unimaginable happened: The mechanics of his Fach Auto Tech team threw up their hands in shock as the Italian became slower and slower, and his car – which had undergone swift repairs after an off in qualifying – ground to a halt on the sideline. “I can’t believe it. Now I’m just unbelievably disappointed. There is still a theoretical chance to claim the championship but to be honest I think Sven is not going to relinquish the title,” said a despondent Cairoli after the race. On the 5.516-kilometre circuit, Robert Lukas secured third and climbed the podium for the second time after Budapest. “I had a great fight with Michael Ammermüller and he tried to force me into making a mistake. But he didn’t succeed. I started from fourth on the grid and, of course, from there you’re keen to finish on the podium,” said Lukas. Ammermüller (D/Lechner MSG Racing Team) finished his race on fourth place and together with Müller earned enough points for their Lechner MSG Racing squad to be rewarded with an early team championship title. Fifth place at race nine went to Christian Engelhart (D/MRS GT-Racing) ahead of Jeffrey Schmidt (CH/Lechner Racing Middle East). After nine of ten rounds, Müller now leads the overall classification with 153 points ahead of Cairoli (133 points) and Jaminet (126 points). In the rookie classification, Jaminet has held an unassailable lead since round eight in Monza. The final race will be held on Sunday at 11.30 hours (local time) on the Circuit of the Americas in Austin. The new champion of the Porsche Mobil 1 Supercup will be either Müller or Cairoli.